Oscar and Stewie wanted to make me breakfast for Mother's Day so they helped Aaron make mini dutch babies. After I broke our big cast iron pan *ahem* my mom found us a new big one and threw in an adorable tiny one to boot. 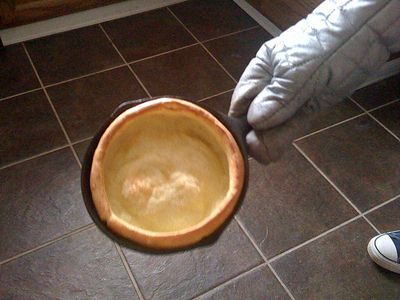 It makes the cutest little dutch baby! That's my mom for you. Thirty five years (and 364 days) later and she is still looking out for me. 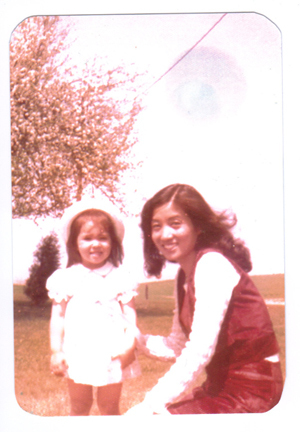 Here is picture of me and my mom. Happy Mother's Day mom!!! Inquiring minds want to know how it's possible to break a cast iron pan? I love the *vintage* picture! What other foods do you make in such a small cast iron? I just bought my first, an 8" skillet, and find that it has seriously transformed my cooking. I'm having lots of fun with it and will be trying out the dutch baby recipe you posted in March! Mary Beth - I don't what happened! I was cooking green beans and added some soy sauce when I heard CRACK! and the pan had a crack down the side and to the middle.